To make it easier to find all of the MicroStrategy Interview Questions I posted, I have added a new page that contains a quick reference to all of them (see screenshot below). I will update this page after every five new interview questions have been added. Which of the following VLDB properties govern the length of a SQL string as well as the time a SQL pass takes to execute? (Select all that apply). The Maximum SQL/MDX Size and SQL Time Out (Per Pass) VLDB Properties govern the length of a SQL string as well as the time a SQL pass can take to execute. Maximum SQL/MDX Size sets the maximum size (in bytes), on a pass-by-pass basis, of the SQL that the ODBC driver sends to the warehouse. Or, in the case of MDX, it sets the maximum size of the MDX that is sent to multidimensional cube sources such as SAP BW, Hyperion Essbase, or Microsoft Analysis Services. The possible value for this VLDB property is any valid integer. The default value is 0 (No limit). The value you enter to define this VLDB property must be an integer. Which of the following options in the Warehouse Tables pane would you use to view the first 100 rows of data in a table? E. You cannot accomplish this in the Warehouse Tables pane. The Warehouse Tables pane, shown below on the left side, displays a list of the data sources available for the project. You can right-click a data source and select from the tasks listed below. Select Mapping Color: Defines the color associated with the data source. A table that is included in a project display this color to distinguish what data source it is from. 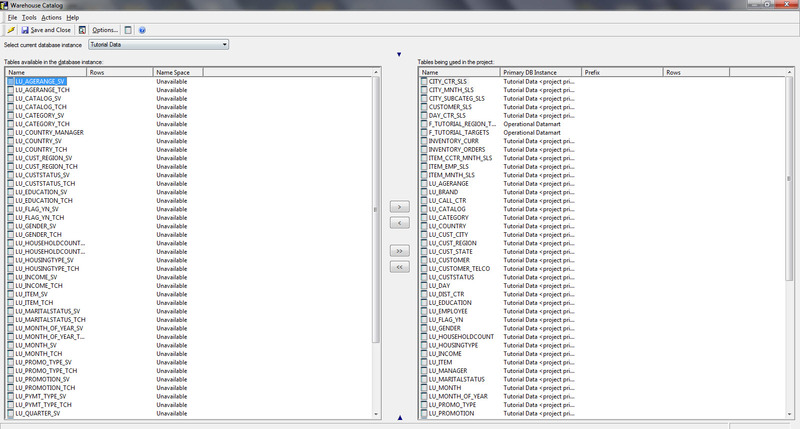 Update: Updates all the tables for the data source to reflect their definitions in the data source. Warehouse Connection: These options allow you to modify the database instance and database login used to connect the data warehouse to a project. Read Settings: These options allow you to customize the SQL that reads the Warehouse Catalog for every platform except Microsoft Access. Table Prefixes: These options allow you to specify whether table prefixes are displayed in table names and how prefixes are automatically defined for tables that are added to the project. 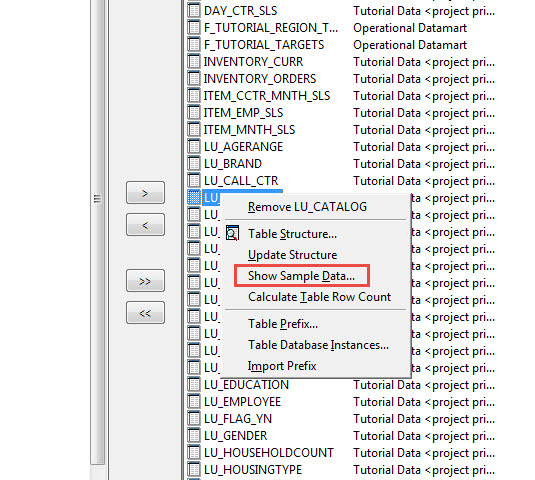 Select Database Instance: Opens the Select Database Instance dialog box to select data sources to display in Architect. Add Table to Project: The table is included in the project schema. You can then create attributes and facts on the columns of the table. This option is not available if the table is already included in the project. Show Element: Displays the table included in the project in the Project Tables View. This option is only available if the table is already included in the project. Show Sample Data: Displays a subset of the data available in the table. This lets you determine the type of data that is available in the table. Update Structure: Updates the table to reflect its definition in the data source. The Warehouse Tables pane also allows you to add tables from multiple data sources to your project. Which type of Slowly Changing Dimension (SCD) would you use if your data was time dependent and you do not require historical comparisons? C. As Is vs. As Is (Type I) involves analyzing all data in accordance with the attribute relationships as they currently exist. Regardless of how relationships change over time, you aggregate and qualify all data (current and historical) based on the current values in the lookup and relationship tables. If aggregate tables exist, you either have to modify how the values roll up to reflect the current attribute relationships, or you have to ignore the tables when you perform this type of analysis.